Colossal tsunami tidal waves caused by tectonic movements under the sea level have proved, especially in the last decades, to represent a high risk for many islands and continental shores. Early warning and notification systems that consist of sensor forecasting and monitoring subsystems and acoustic warning subsystems with electronic sirens can eliminate casualties on the local population. Several countries in the world threatened by the tsunami have already built subsystems for forecasting and monitoring natural phenomena, which are administered by specialised institutions. Our proposed solution consists in the addition of an acoustic warning subsystem (the Pavian electronic sirens network) to such forecasting and monitoring system, and the interconnection of the systems. 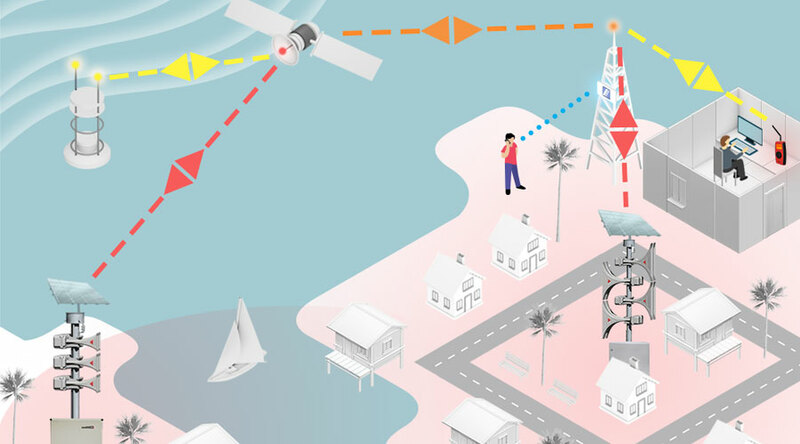 Regarding the necessity to cover large and broken-relief territories, the satellite data transfer is the most suitable control and communications method, which can be supplemented, if necessary, with the backup radio or GPRS data transmission from ground-based transmitters. If the siren is equipped with a local control unit, not only can it be used for warning inhabitants against an impending danger, but also directly on site afterwards by rescue teams for managing their operations and communications on the affected territory. A similar warning system can be successfully used also in case of other natural disasters such as tornadoes, fires, volcano eruptions, or earthquakes. A monitoring system consisting of a set of sensors for the detection of a developing natural disaster. The sensors can be directly connected to the Pavian electronic siren and the data obtained transferred to the control centre. Satellite data transfer for the activation of individual sirens and the data transfer from the monitoring system to the control centre. Control centres intended for the analysis of the data obtained and equipped with the Vektra® software. The Vektra® software allows the sirens status control and activation, control of data transfer channels, and the notification of authorised persons. The system can be hierarchical, with several levels, such as the main warning centre and local subordinate centres. These centres, if desired, can be designed as unattended or remotely-controlled by smartphone, tablet, or radio. Additional wireless data transfer from a ground-based transmitter for the local activation of sirens and satellite communications system back-up. The Pavian electronic sirens equipped with backup batteries in case of a power failure, autodiagnostic functions, and a satellite communications module. When solar panels are used, the Pavian sirens do not require an external power source. They are designed to cover the entire endangered zone with an acoustic signal of the required acoustic pressure. The sirens transmit warning messages before a natural disaster hits the area, and, in the aftermath of the disaster, they can be used to coordinate the affected inhabitants and assist the rescue corps in their operations by voice announcements.